A value for money watering can with short spout for ease, requiring less effort to pour. 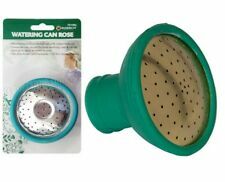 The rose provides a gentle sprinkle suitable for general purpose use.A value for money watering can with short spout for ease, requiring less effort to pour. Children's Watering Can. Perfect for children, also ideal for houseplant watering. Small 1 Litre. Carries Haws seal of authenticity. Sides tastefully embossed with Haws logo. Designed for indoor use. SupaGarden Watering Can Rose. Pack 2 Rubber base to fit most outdoor watering cans|Provides even flow and dispersing of water . Haws Handy Indoor Watering Can. Carries Haws seal of authenticity. Sides tastefully embossed with Haws logo. Designed for indoor use. Light and easy to carry plastic. Suitable for light greenhouse use with young plants. 0.7 litre injection moulded plastic can with a round brass face rose. Engineered from premier grade, recyclable plastic for thick wall strength and long life. Childrens Watering Can With Rose. Colour: Red. This is a lovely decorative watering can that would be perfect for potting up herbs, bulbs or small plants. Use this in your garden for a pretty display. 700ml capacity. Haws Indoor Watering Can. Other colours available. Fits Most Popular Watering Cans. Fine As Rain. 20mm NECK SIZE ( APPROX ). 3" ( 8CM ) Approx Head dia. Fine Spray! Height: 14cm. Total Height with handle: 22cm. Gießkanne Nostalgie Flowers. Ein Hingucker im nostalgischen Stil ist die schöne Gießkanne in Antikgrau mit rötlich-braunen Akzenten und der Aufschrift "Flowers & Garden" auf beiden Seiten. &©Gweny´s Haus. Kleine Gießkanne Altzink. Zauberhafte kleine Gießkanne aus Altzink. Dazu noch hübsch anzuschauen und prima für Shabby Chic, Nostalgie und Landhaus Dekorationen! &©Gweny´s Haus. Abholung vor Ort. Ideal for those smaller watering jobs in and around the garden. Watering can. 5 Litre Capacity. A fabulous little jolly watering can for your budding little gardener! A happy frog to play with in the garden, sandpit or to take to the beach. Take to the beach or use in the sandpit or garden. You can rely on us for quality, efficiency and good old-fashioned service. Collection - Botanical. Colour - Neutral. Fits most watering cans. Jumbo 200pc Superior Curtain Hooks. Beamfeature Blue Rose High Quality Plastic Peg Bag with Clothes Line Hanger in. Ergonomic Left/ Right Handle Folding Walking Stick CE Approved. We are here to serve you as the best way possible. We are here to find the best way to solve. Universal fitting for most watering cans. Sie besitzt eine schwarz lackierte, matt glänzende Oberfläche und hat ein Fassungsvermögen von 0,5 Liter. 42 wollweiß NEU. Badeschwamm Ø8-9cm, Netzschwamm, Massage Schwamm, Duschschwamm, Netz Quast. Edelstahl / lackiert. 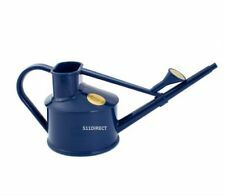 Ward Watering Can 5L. Green Ward 5L capacity green watering can|Very strong and robust|Ergonomically designed handle for ease of use|Extra large opening for easy filling|Wide spout for a fast, smooth pour|General purpose rose included|Made in the UK from recycled materials|Fully recyclable . 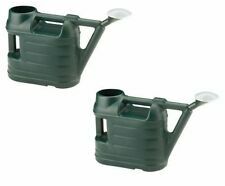 INDOOR OUTDOOR MADE UK GREEN ACRYLIC GARDEN WATERING CAN POT 5 LTR 1 GALLON. 700ml capacity. Haws Indoor Watering Can. Dark green. 'seed sow water grow' watering can. Lovely stylish watering can. Handy for watering plants and flowers. Here at Exactly What I Needed, our aim is to provide you with the best possible choice of high quality, current fun and affordable products. 14.5” Metal Pig Sculpture Watering Can Decor Cute – New ! SCHEURICH USA INC Watering Can, Loop Handle, Transparent/Green Plastic, 47-oz.